The Werk8 offers only a small lunch menu so I was rather surprised to actually find a couple of decent offerings for someone who is forced to not enjoy meat. 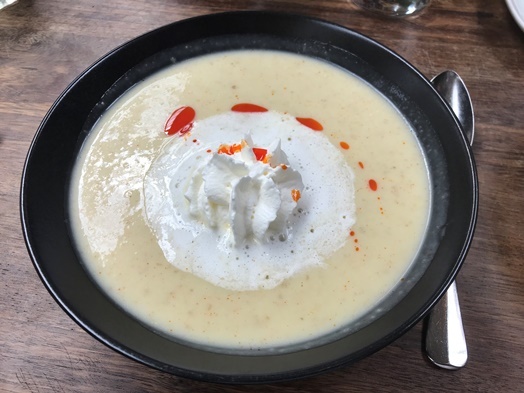 The “potato soup” (CHF 11.00) was good but a much larger portion than originally stated. 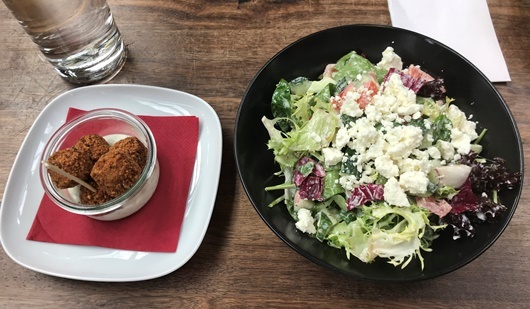 The “salad bowl (mixed leaf salad with feat, cucumber, tomatoes and croûtons)” (CHF 18.00) was served with ‘un-announced’ falafel.. The salad was simple yet rich. 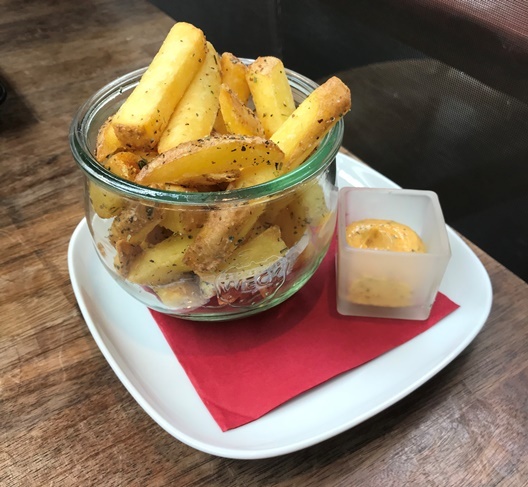 The “French fries” (CHF 8.00) were heavily seasoned but still delicious – especially with the dip. I wouldn’t say you get an incredible amount of choice if you’re eating vegetarian or too much of a balanced meal but the food is definitely much better than expected and generally good. And incredibly reasonable in terms of price. The place is a former storage room (or something similar) and has limited atmosphere in terms of creating a comfortable restaurant atmosphere but all the more in terms of creating a generally pleasant atmosphere. The service is relatively swift and friendly and they are even good in bringing the bill shortly after you’ve asked for it. I would highly recommend to book a table in advance as the place looked relatively crowded (and that despite the fact that it is also relatively large).